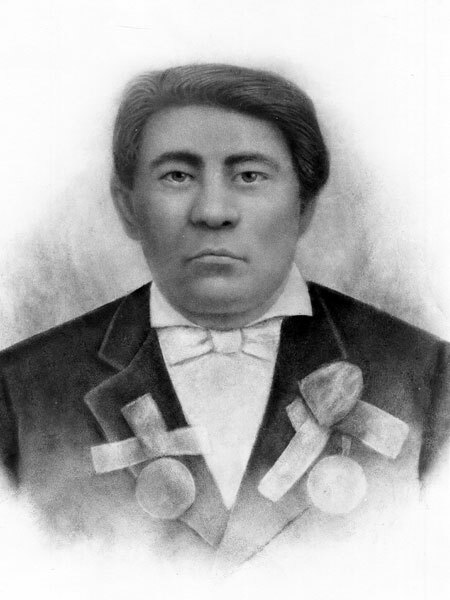 He was a son of Peguis, chief of the Saulteaux Indians, who had taken the European name William King. In his own tongue Prince was known as Pa-bat-or-kok-or-sis, although he signed Treaty One as Mis-koo-kenew (“Red Eagle”). In October 1840, he was married to Sarah Badger at St. Peter's Dynevor. He complained in 1869-70 that the Métis were not sympathetic to the Native people, and he was a firm supporter of the Canadian annexation of Red River. He met the arriving Wolseley Expedition in his canoe at the mouth of the Red River. Prince died at St. Andrews, Manitoba on 7 June 1899. Treaty One, Library and Archives Canada. We thank Anne Lindsay for assistance in preparing this profile.